When the winter cold hits, plants enter a phase of dormancy. 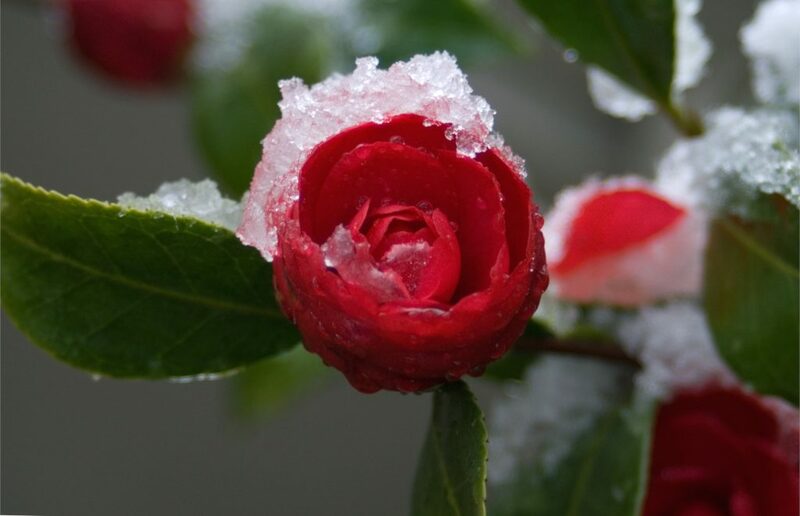 It is important to protect them from the cold and from freezing so that they may burst with life anew in spring! A few simple protective measures can be practiced to help you protect them easily at the lowest cost. 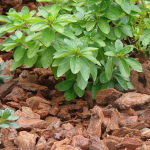 Read also: using mulch to protect plants from the cold in winter. Deciduous plants, those that lose their leaves, practically cease any form of activity over winter, and are much less vulnerable to the cold. It isn’t as important to protect these, even though some plants would appreciate mulch prepared from dried leaves or bark. It is always best to grow plants, trees or shrubs native to your area, because they never fear local winter events. Evergreen plants are another matter altogether, because although slowed, their vegetation is not at a standstill during this period. They still require care, especially as regards frost spells. 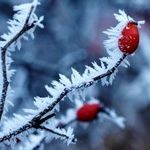 As freezing creeps along a plant, the water portion of the plant’s sap starts to crystallize, which means the sap volume expands and bursts through the cells. Luckily, it doesn’t take just a wee bit of freezing to actually kill the plant. Often, only a very cold extended span of time is likely to endanger its survival. But this also depends on the plant itself, which is why you should learn about how hardy they are. Use any simple plant-based mulch such as bark, flax mulch, a bedding of dried leaves, an inch or so (a couple centimeters) of compost or manure. If you thus protect your perennial plants and your young shrubs, you’ll be keeping the roots free from frostbite. All the plant based mulches also make for great fertilizer. 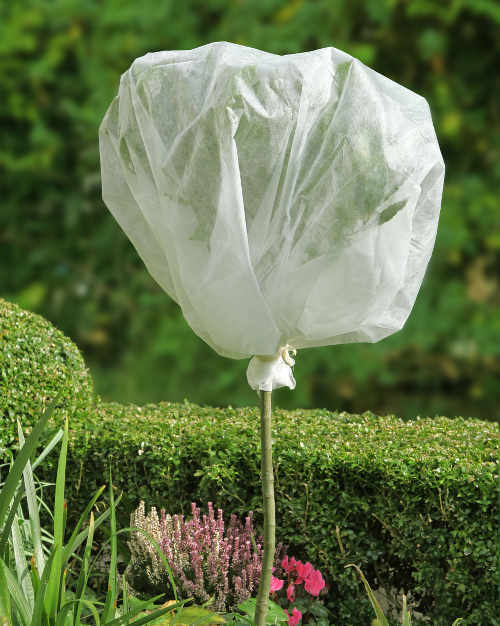 This protection will reduce the impact of freezing since the entire root system is covered and protected. 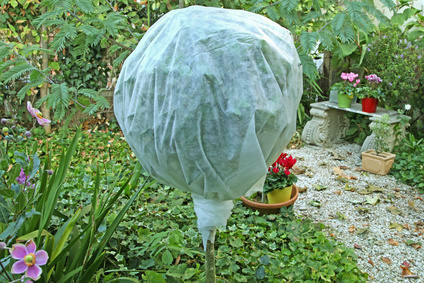 Shrubs can be wrapped in protective cloth called horticultural fleece which will protect their branches. They are the most vulnerable to freezing because the entire surface of the pot is exposed to cold air. It is important to place your potted plants in a place that is the least subject to cold and wind. Certain types of palm trees, olive trees, citrus, oleander and other Mediterranean plants have grown more resistant to cold climates than in olden days. 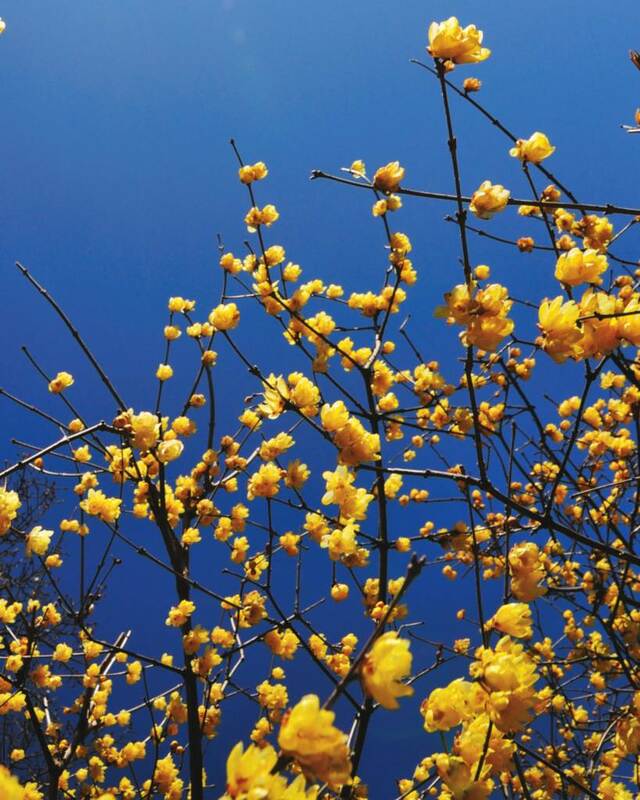 Much progress has occurred because these plants are appealing, but some of it is also connected to global warming. Tropical plants are now found in temperate climates, like palm trees and olive trees, where they previously couldn’t grow. Take note though: horticultural fleece will only go so far, a few degrees at most. For instance, a lemon tree or an orange tree that would be hardy down to 19°F (-7°C) without fleece will now resist down to 14°F (-10°C). 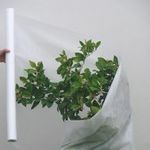 If your area is often subjected to winter freezing, it is strongly recommended to winterize your Mediterranean plants with horticultural fleece, especially if grown in pots. Choose those settings that are most exposed to the sun and least exposed to wind. If you can, bring your potted plants in a sheltered spot, cool and well ventilated over the winter. Finally, just like all other plants, mulch is always recommended to protect roots when winters are cold.